Ever wondered why, when you're doing good things for God, they don't always work out? Why your efforts to bring folks to Christ, for instance, or raise support to be a missionary are such a struggle. Ever had a great lesson to teach your Sunday school class, but you got tongue-tied, or the kids refused to listen? There are several possible reasons, of course. God's timing. Outside circumstances. The hearer isn't ready. And that's just a few. But there's one that perhaps you don't consider too often. Could it be that God is opposing you? I don't know about you, but just because I'm doing the Lord's work doesn't mean I'm in His will. My motives are not always right in His eyes. I write for selfish reasons. I serve to be praised. I pray to look good. I share the gospel to "increase my numbers." I help my husband in hopes he'll help me back. I think, in brief, that my reasons are more important than God's. I'm looking to make MYSELF increase, whether I realize it or not. And that is displeasing to the Lord. And though He sometimes allows us to succeed despite our attitudes, it is not always so. Sometimes, when our pride is our motive, He opposes us, and the work we are doing. And it doesn't succeed. But if we humble ourselves and do His work for His glory, then perhaps He will show us favor and give us the victory - in HIS name. Thanks for reading. Be sure to stop by Vonnie's blog for more Monday Manna. 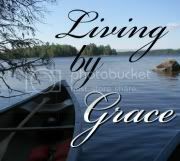 And come chat with ME about this post at Living by Grace. I've heard it asked "Why are you doing the'Lord's Work'"? It's His work, not ours. We are working for the Lord. I've been guilty of serving others in the hopes of feeling wanted or needed, in the name of serving God. It doesn't work that way! Oh so true Joanne, our motives matter to God. While everyone else see what we do, only God knows the why of it. Ouch. So true.You touched on a nerve as I know my motives are mot always pure.Thanks for a good reminder and have a blessed productive week! Sooo good Joanne! Motives for doing things are often overlooked but God doesn't overlook them. Thank you for this reminder! Jo, you are so right. Most of the time I pray: Lord, use me in spite of myself! And I see your blog has a snazzy new look! Joanne, I needed this word today. I really really really needed this word today. :) Love you. I was just reading a passage about this today--not all we build with is gold. A great reminder--God desired moment-by-moment surrender, not commandos! Thanks, Joanne!